I was so moved over the weekend by this story I listened to on NPR's This American Life. It was about parents setting accidental traps for their children, trying to give them advice and make the best choices for them, with all the good intentions in the world, and then the consequences the children would have to deal with years later. The first story literally had me in tears, so much so that I had to pull the car over. It was about a mother who had died and had written her daughter (then 16) a letter every year to be given to her on her birthday. It was so interesting and heartbreaking, and hit close to home. The second part was so fascinating! It was about a couple that lived in Oklahoma in the mid 1970's and adopted a chimpanzee, Lucy, and raised it as if it were their daughter. At about age 12 the parents decided that Lucy needed to be released into the wild. 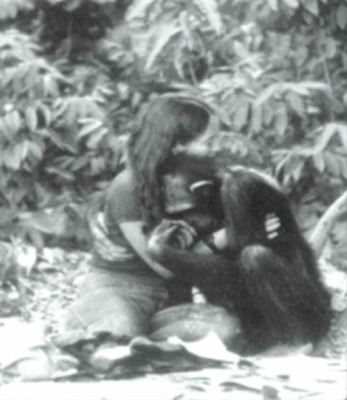 A woman named Janis Carter, a graduate student at the time, spent years with Lucy and other chimps in Gambia, on an island, alone, helping them fight depression and trying to teach them how to live in the wild on their own. The photo above is of Janis and Lucy the last time they saw each other, and the story surrounding it is truly amazing. The description of the events and the photo are just so haunting, they have stayed with me all weekend. If you want to listen to the full episode please do, you wont regret it.